Polypipe has always invested in new innovation and technology to provide water management solutions that support the building industry and helping to deliver better, more sustainable projects. 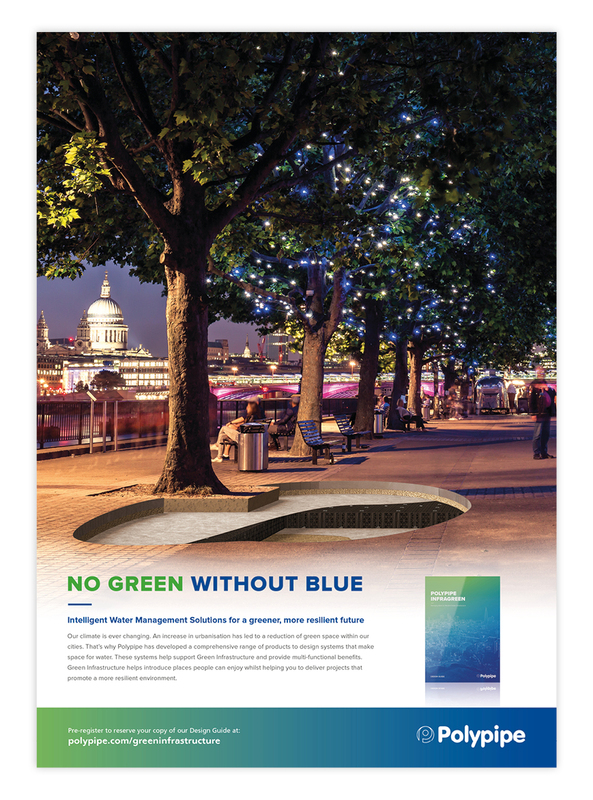 With the negative effects of climate change within our built environments; flooding, Urban Heat Island effect and pollution, combined with population growth and urbanisation, Polypipe wants to utilise its knowledge, expertise and drainage product portfolio to encourage the inclusion of green infrastructure in the design of new developments, whilst making space for water. Subsequent information we need to convey will include the need for more green spaces, to encourage biodiversity into our towns and cities, provide amenity and wellbeing to the population and ensure, moving forward, that our cities become more resilient. This will firmly establish Polypipe as the ‘go-to’ provider for smarter drainage solutions and reaffirm the company’s market-leading position within this sector. 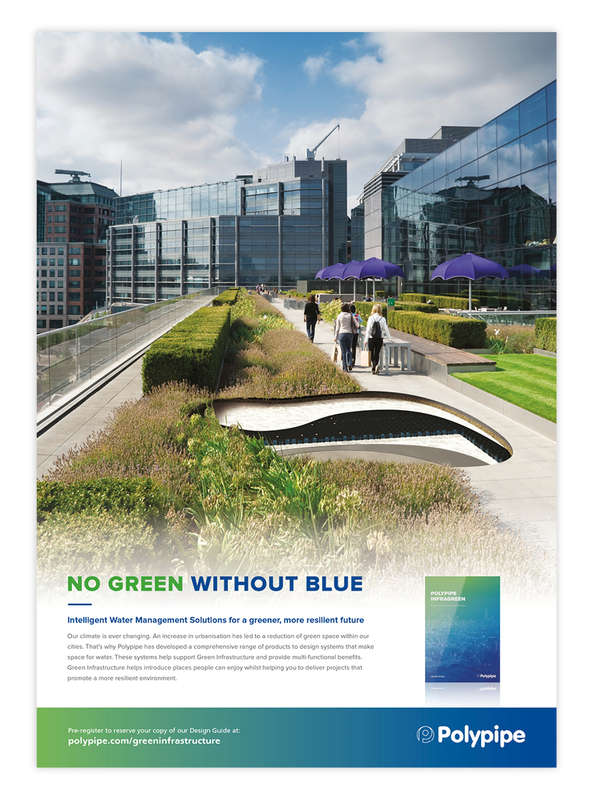 A multi-platform strategy was researched and implemented, and included a 200-page Design Guide complete with ‘easy-reference’ tools to identify the negative aspects of building without Green Infrastructure (GI), how to address these issues and included technical information to specify the best product to achieve the best results. Further collateral included a Positioning Brochure which provided more solution-based information and was used in country-wide seminars and events, supporting the Polypipe sales team whilst helping build brand awareness for both Polypipe and the need for GI. As the momentum increased throughout the year, with the introduction of an industry-focused press campaign, Microsite, eDM bulletins, digital campaigns and social media posts, the message was about to be taken up a notch. Meticulously planned, the launch event; an exclusive high-profile conference held at the prestigious Institute of Civil Engineers in London, provided invitees with a quality insight to GI and making space for water. Polypipe organised the attendance of esteemed specialists from across the industry to share their knowledge, covering a range of topics from Blue/Green roof design, Urban Heat Island and passive irrigation to multifunctional benefits and how to make cities smarter to combat the effects of climate change. 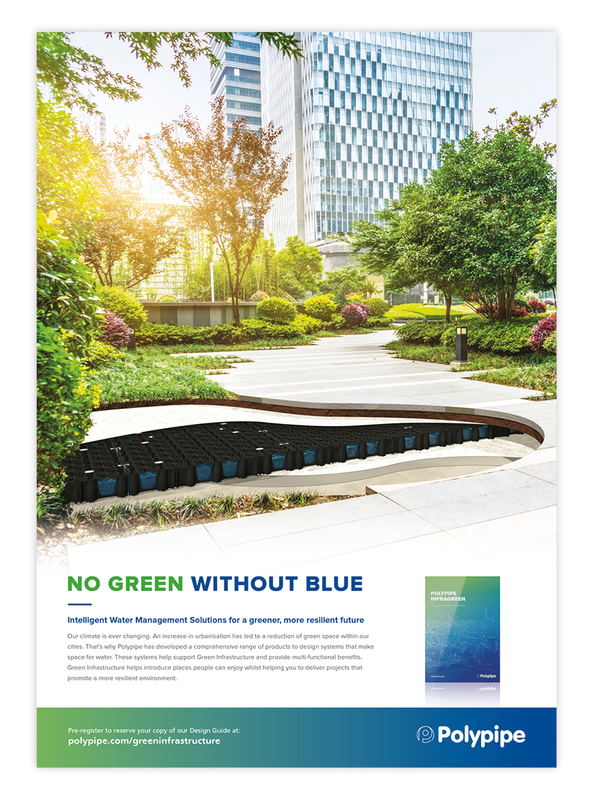 To complement previous communications, a suite of collateral bearing smart new creative designs were produced for the invitations, EDM communications, InfraGreen Conference ‘at-event’ graphics and pull-up banners. To ensure interest for further conferences, video snippets of the conference, including useful information from the Guest Speakers, were made available through a registration scheme via new eDM communications. Whilst the campaign is on-going, the uptake to date has been extremely positive, in particular, full attendance at the InfraGreen Conference and subsequent interest. Polypipe is so confident with this campaign, a whole new website is under construction with launch some time in the new year.